In Marseille, France and Genoa, Italy we have the same situation savate pro, savate - boxe francaise and chauss fight live together in perfect harmony. CHAUSS FIGHT: It is still alive??? http://www.chaussfight.com/ - This so called savate sport is situated in a French version of Italian kickboxing federation FIKBMS. French called it FFSCDA - http://www.ffscda.com/page-249-Chauss-fight%20.html and I am sure that they have similar Ennio as Italians. But good examples follow initiatives also in neighbour countries - so this masterpiece of combat federation is Italian-French cookery. Alfredo was perfect fighter but the Russian boxer was really excellent long distance fighter with a lot of experience. Julien (and his brother Cedric) was also one of the best Belgium fighters and had bad luck with excellent timing of his dominant Russian opponent. Max was so mad that he is now pro - savate pro responsible in FISA..
ITALY: Silvia La Notte ex- savateur seems to have problems with hair? Competitors fight typicaly in kickboxing WAKO style. But they wear integral savate funny old one part dresses - yes to prove that they really train savate. But they are not. For example well known Italian savate trainer Marco Gilloti from Rome is pa member of Italian kickboxing federation (WAKO - FIKBMS) although his friend Lallo (FISA - Italian savate federation) has many problems with FIKBMS which owns savate sport with CONI - Italian olympic Committee recognition. But maybe they are all friend. Why not? Lallo didn't register his savate federation in CONI. Also this WTKA-WKA competition was camouflage that WKA and WAKO are enemies. Most of people think so. But in 2012 it seems that Claudio Alberton moved to FIJLKAM - FIGMMA. As it looks CONI - Italian Olympic Committee can sort disciplines like MMA by Sportaccord regulations - except from savate which is still part of FIKBMS - Italian kickboxing federation. In Italy this things just depend on the nature of situation. Watch Max Greco in his club University of fighting talking about savate pro and chauss fights as the same dicipline. Maybe he doesn't know that WAPSAC in FIKBMS owns Chauss fight as dicsipline. As it seems kickboxing in Italy and savate are not so far away one from another - on a national and interantional scale. It seems that IF as FISav and WAKO cooperate more then we thought. They can invent intermediate discipline like chaus fight which can be later recognised as savate. And the role of Falsone for the future? As it seems his ex, temporary and future people control MMA, savate, kickboxing, muay thai in all the new and old versions of very confused Italian sport life. About the end of his sport career? Lilian Guicherd-Callin wrote this beautiful research about savate. His domain savateworld.com doesn't work anymore. Why? He is now active in a Kung-fu academy white crane? BUT WE HAVE A VERY SPECIAL ARGUMENT WHY THE SECOND TIME STRUGAR LOST AGAINST BELLONIE. IT WAS - HYPERBARIC CHAMBER WHERE STRUGAR WAS SPENDING HIS MINUTES AND HOURS BEFORE HIS SECOND FIGHT WITH BELLONIE. Sometimes expectation makes the same thing as Hyperbaric chamber. This is probably not the first time in the history of combat sports. 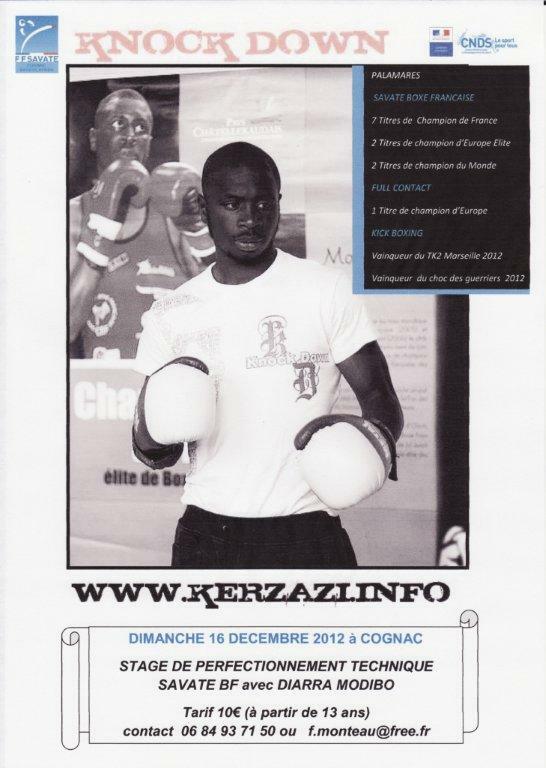 And now Modibo is again in savate - french savate federation. Was this just about WADA and antidoping or it was "savate pro - chauss fight" friendship. And we can describe this problem again and again but the facts inside France show very ineteresting combination of this international play. Stage aprooved by French savate federation. WMC Muay thai: Hari Gorijan produced Frederic Bellonie vs. Ivan Stanic "The terrible"
This was even more terrible then some AIBA boxing olympic matches in London where people asked themselves if the weather in England is guilty for the decisions like we saw also in this fight. Everytime when trainer said to Mr. Terrible - throw him, Bellonie thrown Mr. Terrible 3 times in a row. It was terrible. And broken nose and cut on an eyebrow weren't enough to prove the fact that a boy who stood 5 rounds in the corner is the winner. Please enjoy. At least we can watch this fiasco, finally. The oldest job on the earth and everything connected to it cannot be paid directly. But shows and galas are the best way. Sport. Yes. Sport. It is unnusual these days that some guys outside Russia speaks some words in Russian language. Intelectual fighters doing many businesses.